This is some of the fabric that I bought while visiting my friend in England, and I had planned to make another Simplicity 2444. 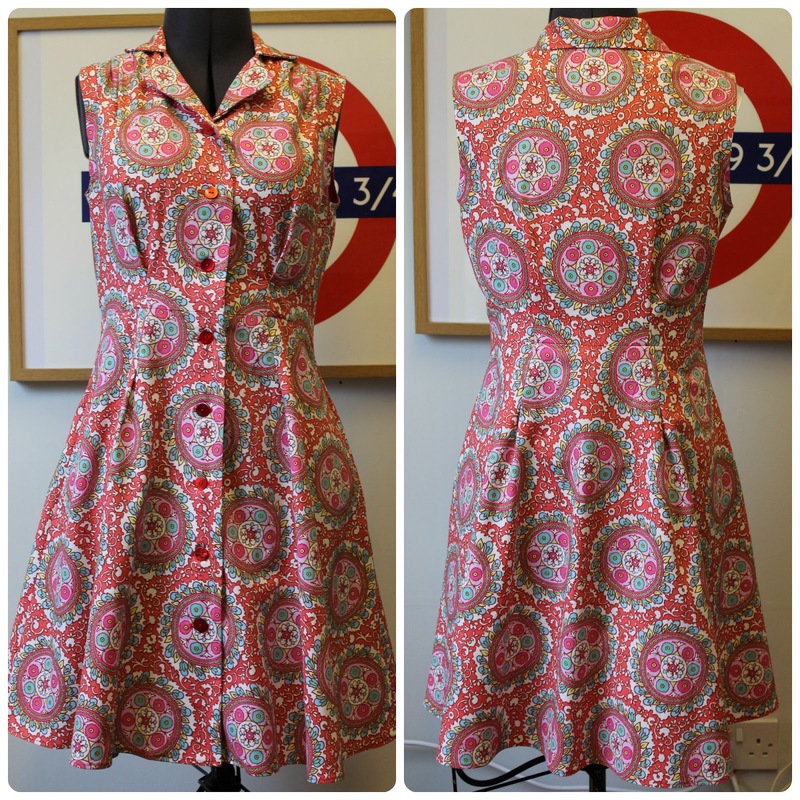 I was inspired by Lara's gorgeous button-back version, and had even bought buttons to match; but after the success of drafting my own collars, the plans got changed, and I made the Sew Over It Vintage Shirt Dress. I drafted the bodice from my block (and am still quite staggered that it worked! ), and the skirt is from the pattern. The instructions were really easy to follow, especially on the collar, as I hadn't sewn one like this before. I mentioned in my last post about my problem with the gaping placket - I added a buttonhole as suggested by Knitlass (thank you!) using Handmade Jane's tip, which was inspired by Emmie's tip - and it made a big difference. So I thought I'd try horizontal buttonholes, just to see how they turned out; I'd spotted them on Clarinda Kaleidoscope's version, and liked the look of them. And the interesting thing is that they didn't gape as much as on the chambray Hawthorn dress. I mentioned this to Andrew (who is not a sewing expert), and he said, "maybe it's the fabric". Now, this was said just to agree with me in my general sewing ramblings, but I think he was onto something! This fabric is a woven cotton, and the chambray is definately a slightly looser weave. I cut this out before the Hawthorn dress was finished, due to running out of thread, so obviously hadn't got to wear the Hawthorn yet. And something that I've noticed is that the waist is a bit high. In the photo below my hand is at my waist, which is about level with the fourth button down (I missed the fifth buttonhole when I was buttoning it up!). The waist seam is about 1 inch above the fourth button. I can live with it on this dress though, and will add a bit of length to my bodice block. I'm hoping this will resolve my problems with buttonhole placement, and I will be able to make room for that elusive fourth buttonhole. I didn't realise the collar was caught up until I looked at my photos! I love this dress! The fit is brilliant, and I'm delighted with my print matching. I had 2.5 metres of fabric, which was 45 inches wide, and just managed to squeeze my dress out of it with only scraps to spare. The fabric is Amy Butler, the pattern is called Angelica, and I got it for £6 per metre. Totally gorgeous!!!!! Love the fabric and of course the dress pattern. You're on a roll!! Thank you! I love your version of the Vintage Shirt Dress too. I'm so glad that I used this fabric to make it. It looks great and your pattern placement is perfect. The tutor at Sew Over It is SO knowledgeable. She told us the criteria for using vertical or horizontal buttonholes but typically I can't remember. It's a really lovely pattern and I will be making another one too. Thank you! I really liked the horizontal buttonholes on your version, and completely forgot to mention it im my comment! I'll definitely be making another one too. That dress is beautiful. It looks like it fits you perfectly and the fabric is great! Thank you! I think I could take it in a little bit at the waist, maybe half an inch. I still want to make a button back S2444 though! It looks great on you! The fabric is lovely, and you did a really good job of the pattern matching. It fits you so well too! Thank you! I really do like this fabric. Thank you! Pattern matching is such a pain to do, but definately worth it! I don't know if this pattern would be the new Anna, because I don't think it's as versatile, but it certainly seems to flatter lots of different body shapes. Another success Lynne! You must be feeling very pleased with yourself - you've every right. Lovely fabric and I like this style on you. Thank you! Yes, I am feeling pleased with myself!! Thank you! Buy it! If you like Hawthorn, then you'll like this. Pretty! Horizontal buttonholes don't gape because of where the stress points are. Lateral pulling on a vertical hole causes the buttonholes to gape open as the button is pulling on the central side of the hole. For horizontal buttonholes the button moves laterally in the hole instead. If it did still pull it would mostly just cause drag lines. In fact the lateral movement in a horizontal button hole gives you a looser fit as you get half the buttonhole width as extra ease (although this is built into some patterns which intent to have horizontal buttonholes, like Tilly's Airelle). I stupidly used the wrong one on my new Miette skirt so I just satin stitched the vertical one closed and made a horizontal one! These are just my thoughts on the issue! Ah!! Thank you for this! That makes a lot of sense. I was watching one of my Craftsy pattern drafting classes last night (I was learning how to draft plackets), and the instructor said that horizontal buttoholes where more common in blouses and dresses, and that they had less stress on them than vertical buttonholes. So I think it's horizontal buttonholes for me from now on! Your print matching is spot on! Looks fabulous on you! Thank you! The print matching was worth all the crawling around on the floor! Fantastic dress! Horizontal buttonholes are genius! The fit looks fantastic and I love that you drafted the bodice from your block. I agree that the waist is a little high, but I like it on this dress. Thank you! I think the pleats on the skirt help to disguise the waist a bit, but I will fix it on the next one. This is so gorgeous! It really suits you! Also your pattern matching is on point!! Oh this is so beautiful! The fit is great and looks really good on you. Great pattern matching, I like the features on the collar lapels. Have seen many good SOI Vintage Shirt Dresses, might have to give this pattern a try.